A healthy cat's eyes should be clear and bright, without any discharge, and the whites of the eyes should be exactly that - white. Fluorescein stain to identify the presence of corneal ulcers or defects in the eye surface. Schirmer Tear Test to determine the level of tear production. Ocular pressure to detect glaucoma. Ophthalmoscope to see in the eye chamber. Conjunctivitis is an inflammation of the membrane that covers the inner lining of the eyelids. This inflammation may extend to involve the white of the eye. It may be caused by allergies or by bacterial, fungal or viral infections. In fact, recurrent or chronic conjunctivitis in cats is often the result of herpes viral infections which can return - again and again. It can be contagious, so keep an infected cat away from others. Corneal Ulceration can occur when the shiny surface of the cornea is scratched or damaged. Again erosion and ulceration, also known as a keratitis, can be associated with a herpesvirus infection of the cornea. Epiphora occurs if your cat's eyes constantly "weep",due to an increased tear production or the normal tear flow through the tear duct is blocked. The fur around the eyes becomes "stained"due to the constant wetting effect which is often the sign that owners notice more often as a consequence of the problem. Cataracts. 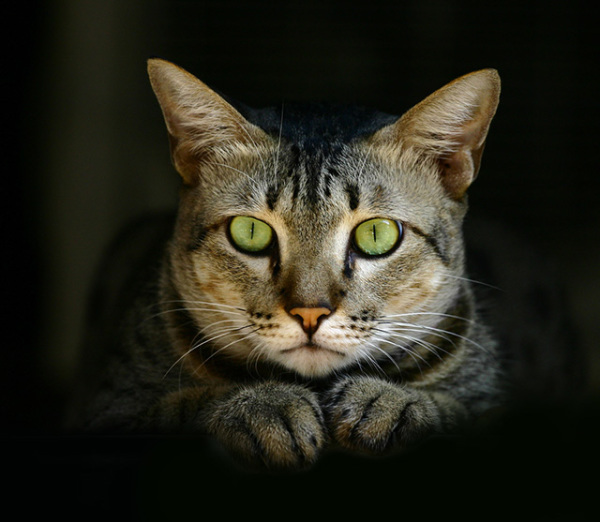 Cats, just like humans, can have these serious eye diseases. Cataracts, which cloud the lens inside the eye can sometimes be seen in elderly cats. A thorough evaluation by your veterinary surgeon is necessary as surgery is the only treatment. Glaucoma stems from too much pressure being exerted upon the eye's interior as a result of a decrease in the amount of fluid draining from it. This increased pressure can damage the sensitive retina inside the eye which can lead to blindness. Remove any discharge from around the eye with a cotton ball moistened with warm water. Use one hand to hold the bottle between thumb and index while using the other to support the cat's head. Hold the bottle of drops close to the eye but DON'T touch the eye's surface. Your cat will blink, spreading the medication over the eye's surface. Hold your cat sideways on your lap or place him/her on a table at a comfortable height (you may want someone to help restrain your cat if you choose the second option).